monopolistic competition (many sellers of differentiated goods & services). Under Monopoly while goods & services are homogenous there is only one seller and hence no anonymity. Everyone knows the monopolist. Under Monopoly there is only one seller facing the market demand curve and that seller has market power to be a 'price maker', i.e., it can choose profit maximizing output. Market power is limited only by the proximity of substitutes. The degree of market power is reflected by the elasticity of the market demand curve. 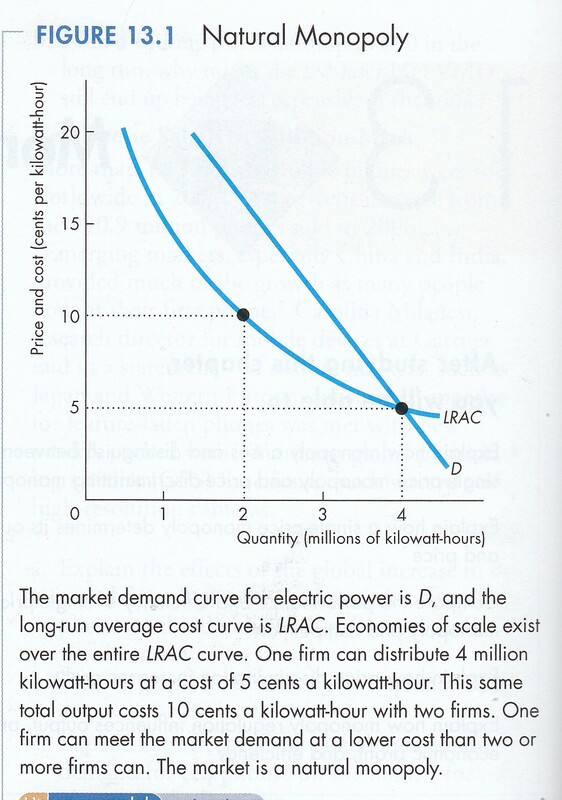 The more inelastic the demand curve, the more market power; the more elastic, the less market power. The market supply curve is the marginal cost curve of the monopolist above the shut down point. Under Monopoly the assumption of perfect knowledge holds. Under Monopoly there are barriers to entry inhibiting competitors. Such barriers exist for one or more of four reasons. First, a firm can become a monopolist because the average cost per unit reaches a minimum (minimum optimum scale) at an output sufficient to supply the entire market at the lowest possible cost (MKM C15/322-3; 303-4). 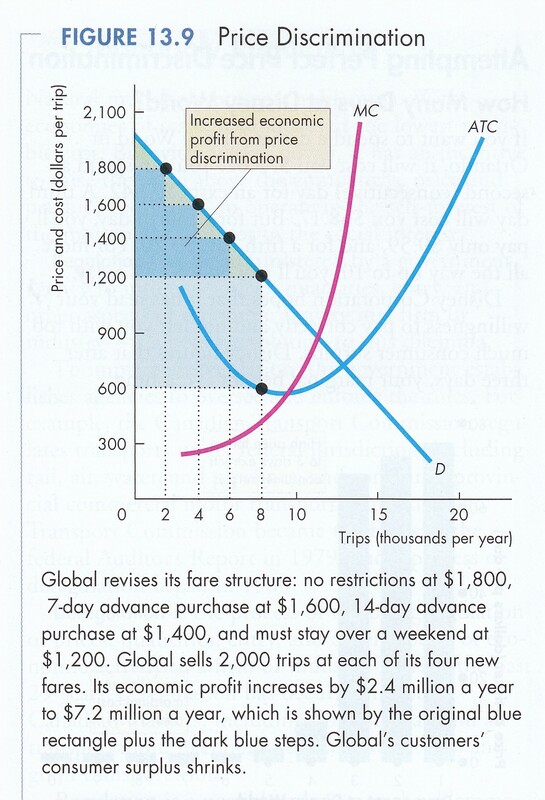 This is a natural monopoly (P&B 7th Ed Fig. 13.1; MKM Fig. 15.1). Any competitor trying to enter the market usually does so at less than minimum optimum scale and hence must charge a higher price. In the short run the monopolist can lower market price below the shut down point of the entrant. After driving the competitor out of business the monopolist can then raise price again. Second, one firm may control the entire supply of a basic input (MKM C15/320-1; 302-3). Thus at the beginning of the 20th century John D. Rockefeller's Standard Oil of New Jersey effectively controlled all oil wells and refineries in the United States. In the middle of the 20th century ALCOA (Aluminum Company of America) effectively owned all the bauxite mines and aluminum smelters in the free world. Third, a firm may acquire an intellectual property right (IPR) - copyright, patent, registered industrial design, trademark - granted by the State (MKM C15/321-2; 302-3). In effect only the monopolist can use the knowledge protected by an IPR. IPRs are granted only for a limited period of time after which the knowledge enters the public domain where anyone can use it. While in force, however, the State will use the judicial system to protect a monopolist's IPRs hence blocking entry into the market. Fourth, the government becomes a monopolist when it grants itself (MKM C15/321-2; 302-3) an exclusive market franchise, e.g. electric power, roads, water supply, etc. In effect, a government franchise is granted when a natural monopoly exists for a good or service considered too important to the public interest to be left in private, profit maximizing hands. The monopolist thus faces the market demand curve alone. As in perfect competition, the market demand curve is constructed from the horizontal summation of consumer demand curves. In perfect competition, however, a firm has no control facing, in effect, a horizontal perfectly elastic demand curve at market clearing price. It can sell as much as it wants at market price and profit maximizes where P = MR = MC (MKM Fig 14.1). The monopolist, however, can increase sales by lowering or decrease sales by raising the price. 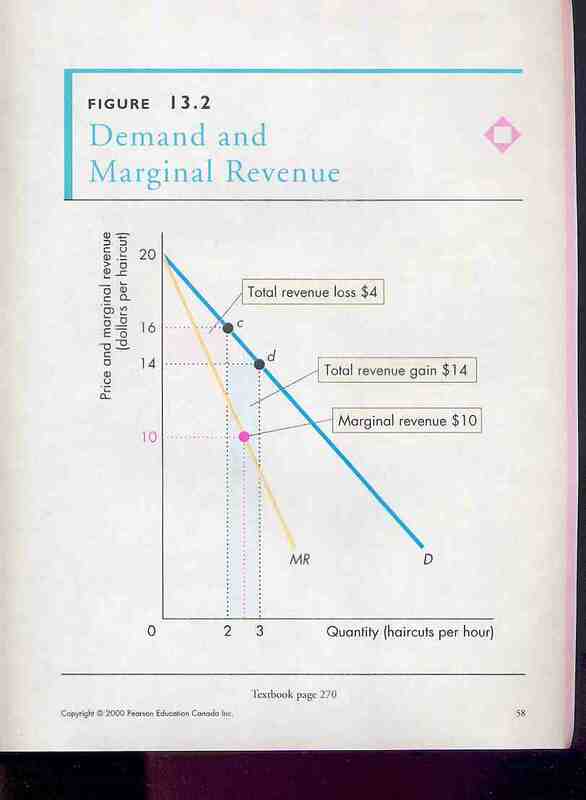 This means a new curve emerges called the marginal revenue (MR) curve (P&B 4th Ed Fig. 13.2; R&L 13th Ed Fig. 10-1; MKM Fig. 15.3). 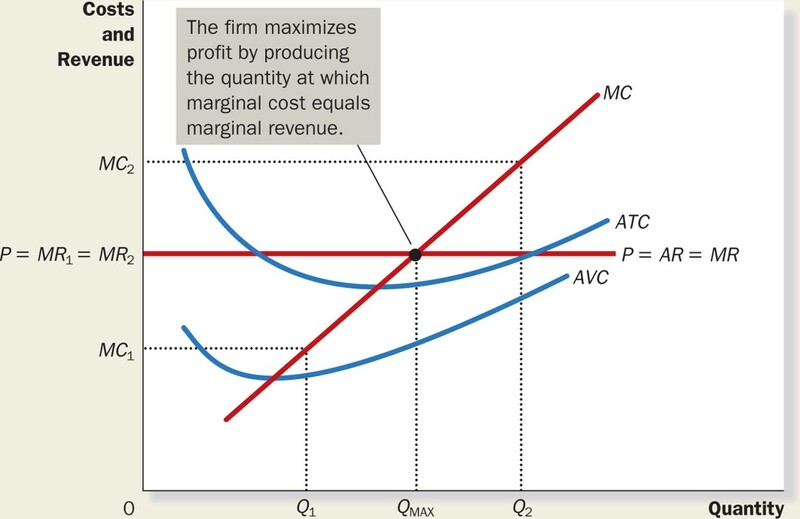 Profit maximization occurs where the revenue earned from the last unit sold (MR) is exactly equal to the cost of the last unit produced (MC). And what is the output at this point (in MKM Fig. 15.4, point A)? 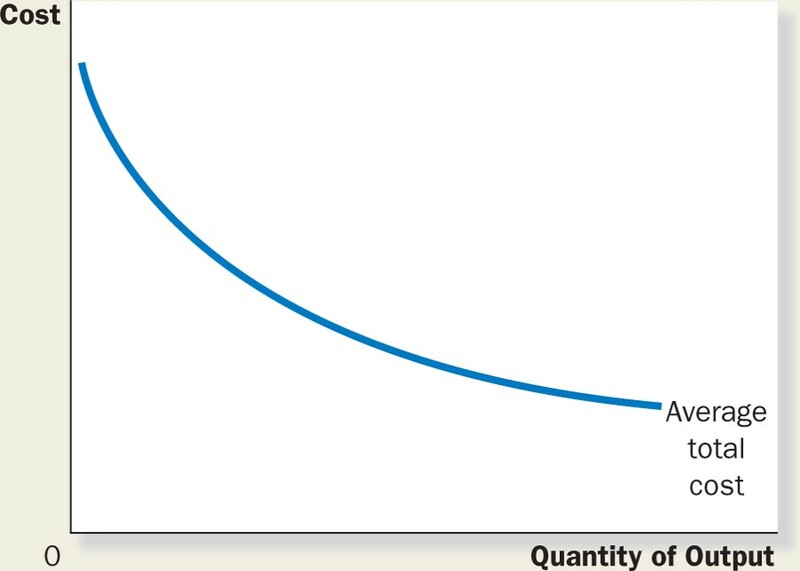 Graphically we drop down from A to the x-axis (quantity) and arrive at the profit maximizing quantity (in MKM Fig. 15.4, point Qmax). And what is the price consumers are willing to pay for this quantity? 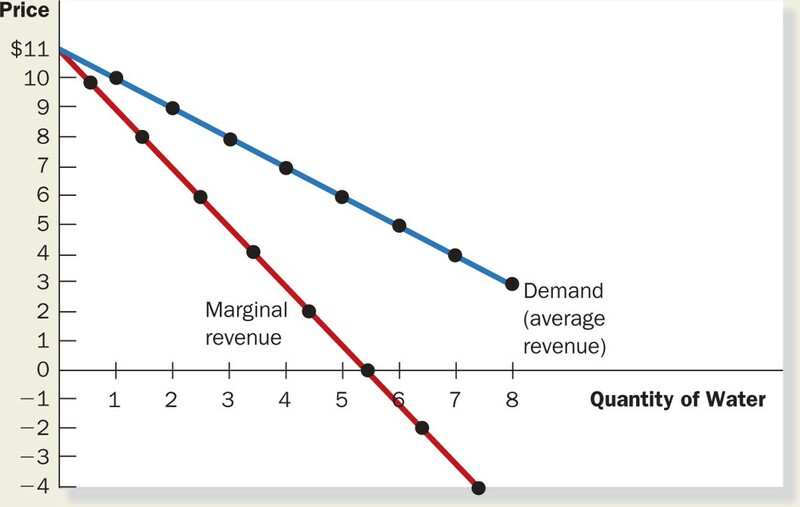 Graphically we move straight up from the profit maximizing quantity to the market demand curve that reflects the willingness to pay (in MKM Fig. 15.4, point Monopoly price). 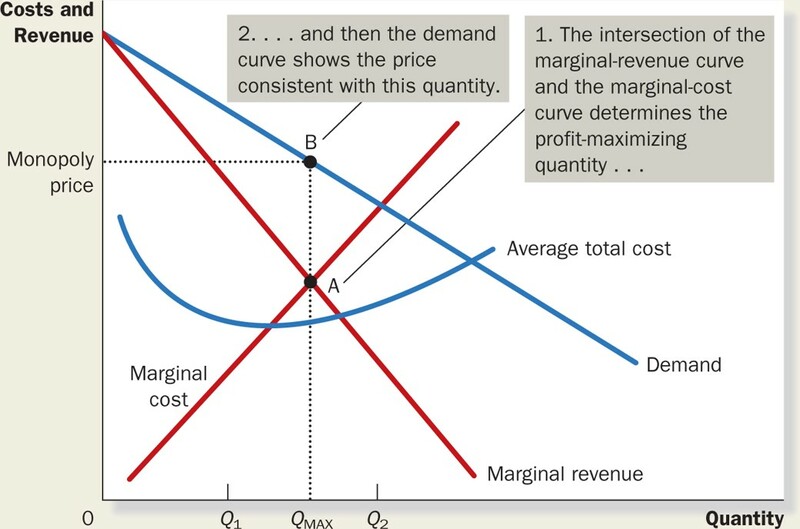 In the short run, following the diagram below, the monopolist produces at Qm not Qc, the competitive output corresponding to where Demand meets Supply at point S (the marginal cost curve of the monopolist). Thus the first cost of monopoly is a smaller output than under perfect competition. The second cost is a price of Pm rather than PC, i.e., higher price. The third cost is allocative efficiency. 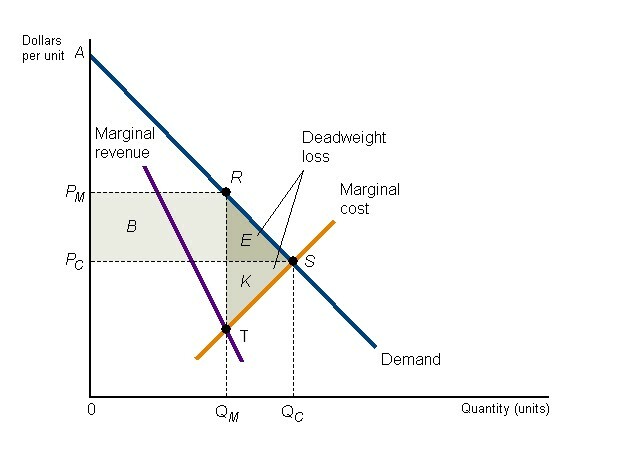 If the monopolist supplied Qc then consumer surplus would include the triangle E (consumer surplus every thing up from price to the demand curve). Similarly, producer surplus would include triangle K (producer surplus everything from price down to the supply curve). However, because the monopolist produces at Qm rather than Qc both consumer surplus E and producer surplus K are not generated. They are lost - triangle RST. This is called the deadweight loss of monopoly. In other words, the monopolist does not allocate enough capital, labour and natural resources to produce the competitive outcome, Qc. Monopoly displays allocative inefficiency. 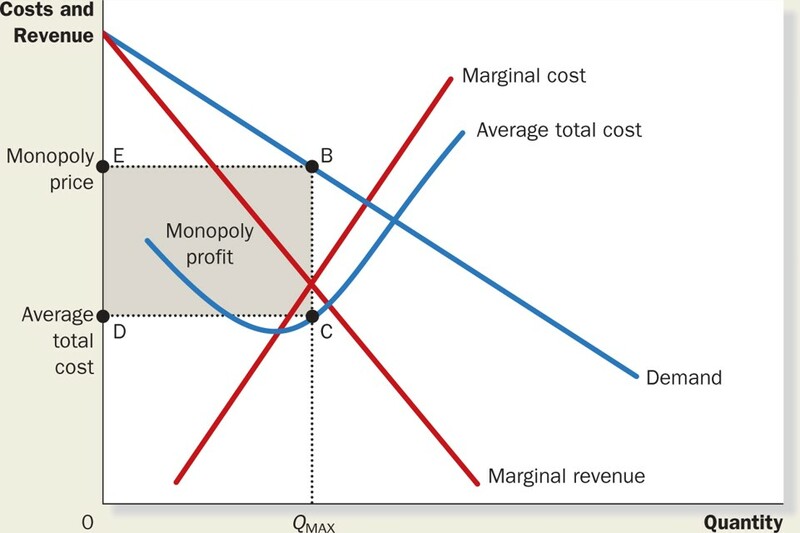 The fourth cost of monopoly involves the appropriation of consumer surplus in the form of monopoly profit (rectangle B). Why are consumers willing to pay a higher price for a smaller quantity? The law of diminishing marginal utility. Unless barriers to entry fall, e.g., a patent expires, then in the long-run the monopolist will continue to earn economic profit. It may, however, still enjoy economies of scale and increase the size of its plant & equipment. The result will be lower costs and lower prices but continued and probably higher economic profits. So far we have consider what is called 'a single price' monopoly, i.e., all consumer pays the same price. 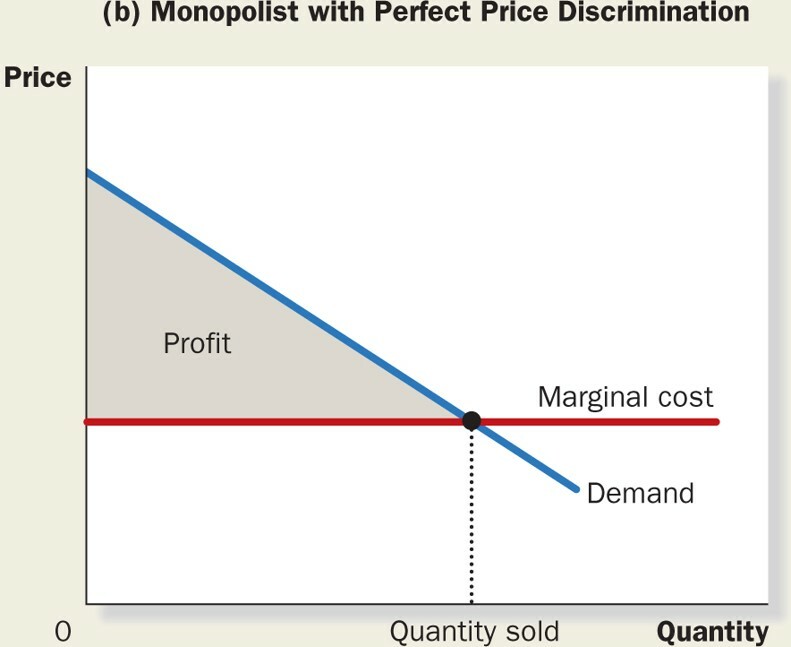 However, the most profitable form of monopoly is the price discriminating monopolist who, in effect, disaggregates the market demand curve into individual consumer demand curves and charges each consumer a price that extracts all consumer surplus and maximizes profit (P&B 7th Ed Fig. 13.9; R&L 13th Ed Fig. 10-6; MKM Fig. 15.9b). Classic example is the town doctor who charges the farmer a chicken or sheep for a broken leg but charges the town banker a much higher price for the same service.